Don't shell out all your money for natural laundry detergents. 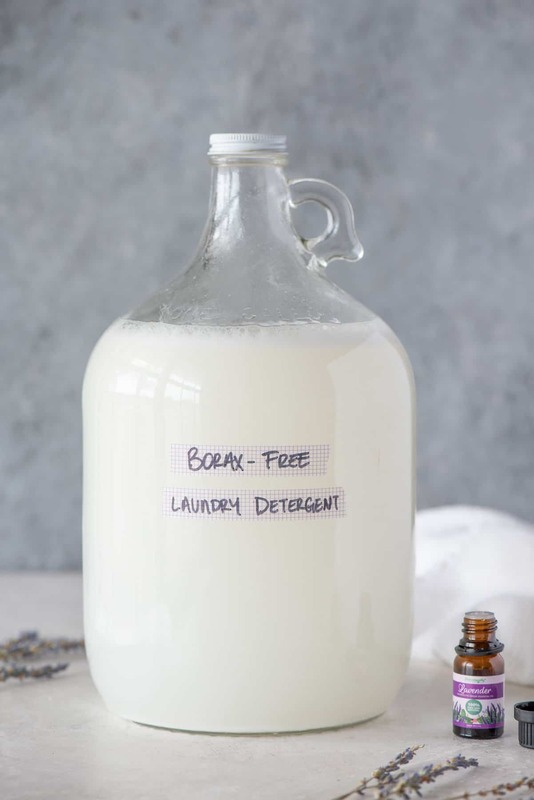 Make your own borax-free laundry detergent for less than $5 per gallon instead! When we made the switch a few years back to all-natural cleaning supplies, we switched our laundry detergent, too. We started off shelling out lots of cash for all-natural versions on store shelves, but we figured there had to be another way—they were just so darn expensive! My husband and I started researching homemade laundry detergent out there, and there were a ton of options. And a lot of them used borax—an ingredient that we were hesitant to use. We were trying to get away from unnatural ingredients, and while there is no clear “yes, it’s good for you” or “no, it’s bad for you” verdict on borax, there are enough negative anecdotes and studies out there about it that made us want to try to avoid it if we could. So we started searching for a borax-free laundry detergent. There were decidedly fewer recipes out there without borax. So that meant it was experimentation time! 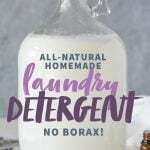 It took a few trials, but we ended up figuring out a borax-free laundry detergent that works really, incredibly well for us. We’ve been using this for years and our clothes get clean—like, really clean. And we’re pretty tough on our laundry. We do a lot of manual labor around here—playing in the dirt in the garden, sweating up a storm, and getting our clothes into all kinds of not-so-clean situations. We’ve definitely put this stuff to the test. I think my favorite part of this detergent is that my clothes don’t smell like anything when they come out of the dryer. No lilac fields or clean summer dew scents. It took me a really long time to learn that “clean” doesn’t smell like something. Rather, true “clean” smells like absolutely nothing. And this detergent gets our clothes to smelling like nothing! 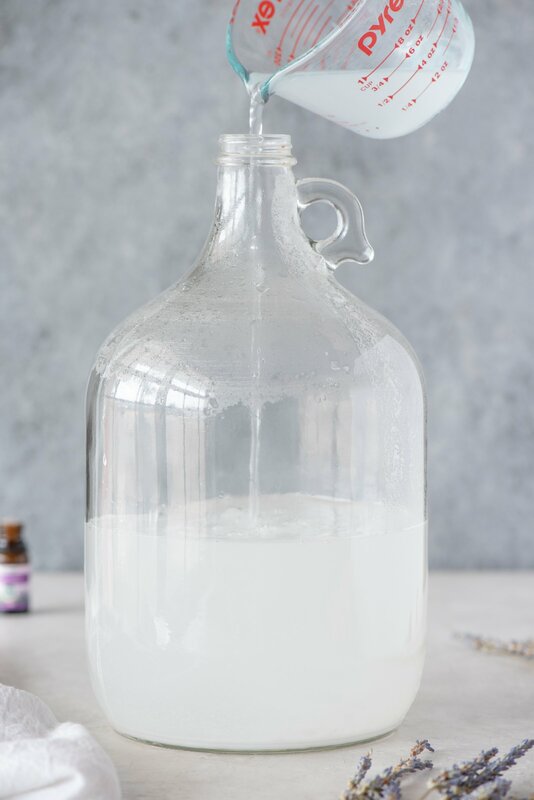 Of course, if you like some scent in your laundry, you could throw in a few drops of your favorite essential oil to the mixture (in fact, lemon is an all-natural stain-fighter, and lavender is always a wonderful scent to add to almost anything!). I will say that we have regular top loading washer, so I have no idea if this will work with the fancy new-fangled front-loading machines. It might—because it’s a low-soap, low-suds mixture—but try at your own risk! We also didn’t use this stuff when we were washing cloth diapers, because I had no idea if it would break down the absorbency—we just stuck to Rockin Green for those. Don’t shell out all your money for natural laundry detergents. 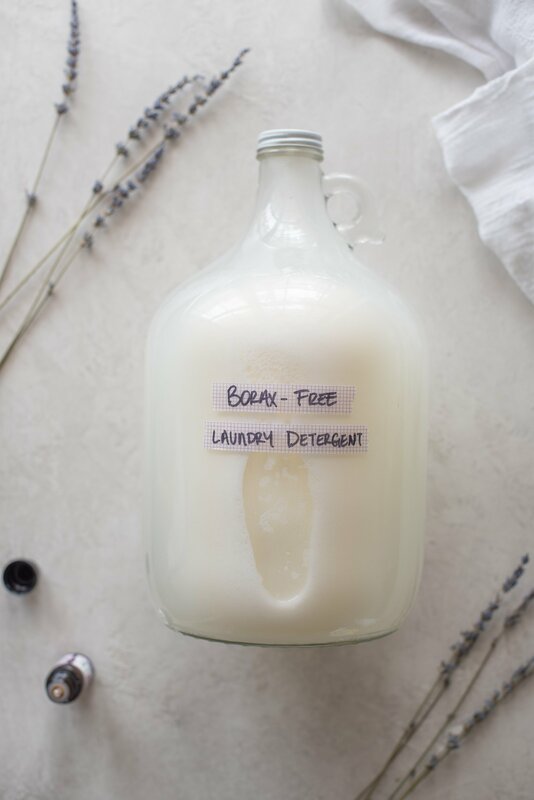 Make your own borax-free laundry detergent for less than $5 per gallon instead! In a large glass measuring cup or bowl, combine 7 cups of the hot water with half the baking soda (1/2 cup) and half the salt (1/4 cup). Stir well until completely dissolved. The mixture will start out cloudy and fizzy, but when it’s completely dissolved, it should be mostly clear. Pour the mixture into a gallon-sized jug. Repeat step one with the remaining water, baking soda, and salt, and then add the mixture to the gallon-sized jug. Add in the liquid castile soap and essential oil, if using. Swirl gently, close, and label. 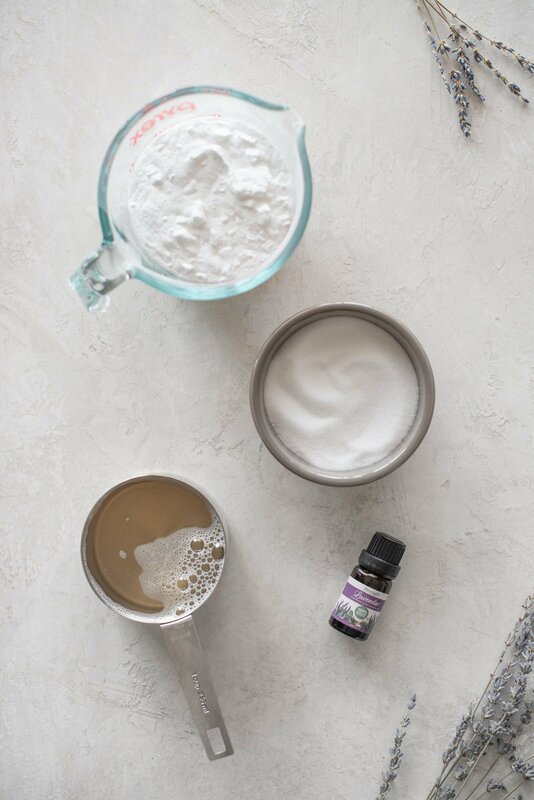 Shake the container to mix ingredients, then either pour 1/2 cup (you can use more if it’s a particularly dirty or large load) of the solution into the washer while it fills, or place it in the soap cup provided in your washing machine. This recipe has NOT been tested with a front-loading high-efficiency washer. I use it in my top-loading HE washer just fine though. We break up the baking soda addition mostly because people don’t usually have a 16 cup measuring cup! It also seems to help get the baking soda to dissolve properly. This recipe uses almost the max amount of baking soda density that can dissolve in water, so make sure not to add more baking soda or use less water. 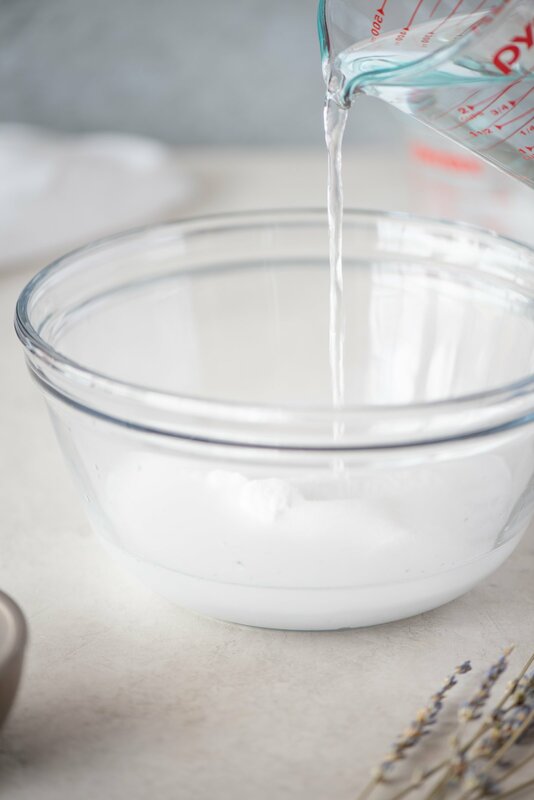 If you are having trouble dissolving the baking soda, heat the water, salt, and baking soda in a large pot over medium heat until completely dissolved. Aaaaaah, this looks excellent! I started using soap nuts a few years ago, but they (well, the ones I buy, anyway) don’t work all that well for temperatures under 40°. So it’s always a trade-off for me to pollute the environment by heating water more than necessary (besides the fact that not everything can be washed at hot temperatures) vs. using a not-so-natural detergent. Do you have any idea whether this stuff needs hot water to work well? We use it with cold water all the time. In fact, the only time we wash anything with hot water is when we’re washing diapers. I totally appreciate your desire to move towards more natural options, but I have to implore you to please please keep and open mind when it comes to your cloth diapers. If the Rockin’ Green is working for you for now, that’s great. But cloth diapers are cloth. They aren’t anything special and using heavy detergents on them and even bleach isn’t going to do anything to them but get them super clean. The more natural detergents that don’t clean very well can appear to work in the short term, but over time the diapers get dirtier and dirtier and can even develop ammonia from the urine not being washed out, which can lead to ammonia burns on little heinies. It’s very sad and despite what most CD retailers will tell you, it’s not from too much detergent. That doesn’t make any sense at all, more cleaning power should not equal more dirty diapers. I speak from experience (except the burns, I thankfully wised up prior to it getting that bad), and had to move away from soap nuts because it just was not getting things that contain human waste clean. While I’m not a huge fan of Tide for the environment or in general, nothing else gets my diapers clean enough, and after over a year and a half of use I can assure you that even diaper I have is still in great condition with no noticeable wear on the fabric or decreased absorbency. I am the Operations manager at a large TNR Center/cat rescue. I daresay NOBODY gets more protein based grossness than us…maybe a human hospital…but we get the worst of the worst. We do about 5-8 loads per day. We utilize both a brand new Speed Queen top loader that fills ALL the way up with scorching hot water, and also a whirlpool Duet front-loader HE. machine. Until this year, we ran whatever big brand liquid detergents that were around…usually Tide……along with a scoop of borax. After a tremendous amount of research and analysis, we have switched to Amway SA8 powder exclusively, and no longer require the borax. I am still eyeing JR Watkins Detergent…but haven’t tried it yet and and have switched all our operations and protocols over to the SA8 and love it. We went from constantly changing and confusing amounts of drippy, messy liquids,.. to a single 3 tbsp scoop per load. Incredible!!! And an awesome printable to boot!! Thank you! Thank you!! Yay! I can’t wait to try this. And Real Salt if from Utah :) So I like it even more! I normally use 7th generation laundry detergent and it’s soo pricey. I can’t wait to make this – great post! If anyone tries this out in a high efficiency (front loading) washing machine, please let us know how it works out. Made some liquid castile soap and thought I’ll try out this recipe. I like that it doesn’t contain borax and I don’t need to bake my baking soda to make washing soda. I used it on my HE front load washer and it was fine. So far I can’t tell the difference between homemade and store bought. That being said, the true test is when the clothes have been in the drawer a few days and my husband isn’t complaining on some funky smell or strange texture. How much soap did you use for a load of clothes? This is awesome. I recently made enough laundry detergent to last us until the apocalypse- however, it’s a recipe with borax and I’m pretty sure it’s making my son break out in hives. Fortunately it was super cheap to make. I’m excited to try this one instead! Yes if it has borax in it it will cause hives……by experience! I have to ask have you ever used Kosher salt? Also, what about using some of the scented castile soaps? Have you ever tried any of them? There are quite a few really nice scented ones – peppermint, lavender, tea tree – which I think might be quite “clean” smelling and not overly scented. I have a front loading high efficiency and think I might give this a try. Thanks for the post! I have used Kosher salt, and it works just fine, you just have to make sure it dissolves well if you use the chunky stuff. And we have used the scented ones—lavender and peppermint, but I can’t really remember the smell lingering on our clothes. We use Dr. Bronner’s, and it doesn’t contain sodium borate, but it does use potassium hydroxide. Everything I’ve read says that the potassium hydroxide is used up completely in the chemical reaction that makes the soap, and there is none left in the final soap. Thank you! I have found several NZ stockists of Dr Bonner’s range. I’m not sure why I didn’t find them initially – my search skills are obviously lacking somewhat! :-) I have ordered a bottle and as soon as it arrives I’m in business! Thank you so much for this. I used to make my own detergent, a powder form, that contained borax,, but I always worries about it. Grating soap got to be too much work when baby 3 arrived last year plus I noticed our whites were getting really dingy and gray. I switched to a natural brand, but I hate paying for it. I can’t wait to try this! No boar band no grating bars of soap! I’ve made laundry detergent before; was not impressed. I’ll give this a try and see how it goes. I’ve been using this for a couple of days. It works great! No suds. Thank you so much for the recipe. Huh! I’ve never had that problem! It’s pretty much barely thicker than water for me. Ok thanks I will try to make it again this weekend and see………I used table salt, do u think it matters what kind of salt you use? Mine gets that way too, especially when I cook it. I make my own soap then grate it, add the Epsom salts and then the baking soda when it cools. It does this to me all the time…and has a tendency to explode when shaken… LOL… I am going to try and go by this recipe instead of my way… Just a few adjustments and I think it will work just fine. I tried this recipe and it’s awesome! The country where I live is filled with detergents with strong fragrances that cause problems for my husband and I. The only places to find unscented natural detergents are 40 minutes away and they are very expensive. I had to make my own liquid castile using a really simple recipe I found on Pinterest (I purchased “baby castile”, which is very lightly scented, but only $0.84). I couldn’t find real salt that was inexpensive, so I skipped it. It came out fantastic anyway! I also found that this detergent is able to obliterate odors that the store bought detergents couldn’t! It’s wonderful for anyone with sensitivities or allergies to fragrances and strong chemical cleaners. Thank you for this receipe which I can’t wait to try out. In the UK we don’t have Borax, so great to know you can make a detergent with out. Some very convincing reviews too :) Happy washing ! Hey, I am worried about my white cotton clothes as it not looking clean after the wash. I cannot use the chemical based products because it would be harmful for our us. However, it seems extreme to having a great natural detergent recipe. Hi – This looks great! Have you tried it with washing soda instead of baking soda? I just bought a box of washing soda and would like to use it for a detergent recipe. Hello! Just wondering if anyone has ever had a problem with the salt rusting their washing machine. Thanks! Thanks so much for this recipe – Looking forward to trying it! 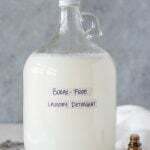 Homemade detergent appealed to me every bit as much for the cost savings as for the simplicity and minimalism of the ingredients. So I made up a huge batch from a promising recipe I’d found, and after a few weeks of uneventful clean clothes, I took a nice trip to the prompt care clinic because all of a sudden my whole body from neck to knees was covered in a solid coating of hives and one of my arms started swelling up. The way it was everywhere, I had no idea what was causing it. Three harrowing weeks and two steroid courses later I finally figured it out… the hives were literally everywhere I wore clothes. Who’s got two thumbs and is startlingly allergic to borax? This girl right here! I felt really foolish at first, having a bad reaction to homemade when DuPont-made commercial stuff was fine. But I suppose it’s no more “foolish” than an allergy to a common food. I’m so, so glad it’s just that one, very optional ingredient. is there a reason for baking soda and not the washing soda. I just bought a big box, too, and wondered if it will work the same. The baking soda doesn’t actually dissolve, right? I wondered if I could just leave the baking soda out of this recipe? Is the soap enough of a cleanser to be able to leave the baking soda out? Thanks!! Mine does! I’ve never tried it without the soda, so I’m not sure. From what I’ve been reading baking and washing soda can be used interchangeably, halving the washing soda when subbing for baking soda. How did it work out? Curious as I was thinking of making the same substitution. I love this recipe! Do you mind if I share on my blog? I had some bad experience with homemade cleaners. I did your recipe, though. It was awesome. I managed to clean my clothes without any complications. Thank you for explaining everything so simple. Best regards! Not sure how you got the baking soda and salt to dissolve. Am I doing something wrong? I had mine boiling and it still hasn’t dissolved. While salt and baking soda do seem to dissolve somewhat when I make it, the detergent always separates in the jug. That’s not a problem, though – just shake the bottle before using, so you get the right ratio of all ingredients. Everything will eventually dissolve during the washing cycles. Has anyone/ do you know of anyone who has tried making this with bar soap, grated or some such? In my experience, using a powdered laundry mix is more effective. I use castile soap bars (Dr. Bronners), along with washing soda over baking soda (because washinn soda is more effective). You can just grate up the soap bars and use the other dry ingredients. 1-2 TBSP per load will work, and it’s good on HE washers. What a great recipe for laundry detergent! I have to try it! If I have to be sincere I am new in “green” cleaning because I have a little child and I want to do my best for her! Thank you for sharing! Hi there, I’m really keen to use this recipe but I live in the UK, is there any chance you could convert these measurements to uk for me? Yes, it would work fine. Although it does have SLS in it, which makes the resulting detergent not natural and much more harsh. Thanks for sharing this, sounds like a great recipe and I love that it doesn’t have Borax in it. How long should it take for the baking soda to dissolve? And does it matter if it doesn’t dissolve?Every time I stop stirring the soda just settles back on the bottom of the jug, even after heating on the stove for 10 minutes. I’m still going to try it though since you say to shake the mixture before using anyway, but wondered if I’d missed something. Thanks! It worked a treat, can’t believe I’ve been wasting so much money on nasty chemicals all these years. I am so interested in this but I have a few questions.. I was using Dr Bronners in my HE washer, and definitely noticed colour fading. I usually wash at 40 degrees. I was using about 1/8 cup per wash as recommended on the Dr Bronner website for HE. This recipe obviously uses much less soap, so I am hoping it doesnt fade clothes? But since it has so little soap to act as a surfactant, does it actually clean well? I’ve never seen any reaction like this—only with baking soda and vinegar. I shake the heck out of it, and have never had the top pop off. I did get a lot of foam when I shook it.. possibly because there was a little bit of my original laundry detergent in the bottle or possibly because I substituted the salt for epsom salts. My lid didn’t pop, but I was surprised by all the bubbles because I thought it would be a bit like the normal eco detergents, which are not bubbly at all. I put my detergent in a glass Mason jar. I am waiting to put the top on until it is cool. Has anyone tried this? Also, the recipe on the blog says 4 cups of water but the recipe when clicking the laundry label says 2 cups of water. I used 4. Which is it? Thanks! I started using this recipe and its magnificent! The clothes come out soft and extremely clean. I like it better than store bought because the clothes do not come out stiff. I put sweet orange essential oil in it to give it a fresh smell. I can say with all these years of washing, this is the best soap I’ve ever used. Plus it gets the clothing clean! I have been through numerous recipes in search of my favorite one. This one has stood the test of time! Been using it for 3 months now. Easy to make. I have the recipe memorized now. Thanks!!!! Hi. I have just recently decided to turn our house green and I’ve been researching laundry detergents. We live in India and a part of our laundry load is hand washed. I noticed this recipe does not use washing soda, which is a skin irritant. I have a few questions. Is baking soda as effective as washing soda (since this is one of the few recipes I found that does not make use of washing soda) would it be better for the skin if I add vegetable glycerin to the recipe? Do you think this recipe would work for a prewash soak? And would the addition of lemon essential oil improve the effectiveness of the recipe? Thanks for posting this formula!!! Have been using this for months and love it…. And I have two teenage athletes with very dirty socks, so that’s really saying something! Just curious why you recommend baking soda as opposed to washing soda. Does it make a difference? I made this with Borax and it worked great. Without Borax, not as effective. I wanted to know what you could subsitute instead of using real salt if there is a good subsitution that will get the same results. You can always use vinegar in your rinse cycle to strip your cloth diapers if there is a build up from your homemade detergent. Vinegar also acts as a natural fabric softener. I always washed the kids cloth diapers in my regular detergent, but added a cup to cup and a half to the rinse cycle. Never had any problems with build up causing a lack of absorbency (which all commercial fabric softeners will do). Hello, do the clothes come out white? Or can I add Oxi Clean to the mix?? Thanks so much. Can not wait to try this. I was getting tired of grating the soap also. Oxy-Clean is 99.9% borax..if that matters to you. I had trouble with the baking soda dissolving also even though I would boil it on the stove. Maybe my water is too hard here in East Tennessee. I was able to dissolve 1/2 cup in 4 cups of water so I am going to try and dissolve in 2 batches and see if that helps. I just made this and the baking soda and or salt just doesn’t disolve, It just sits on the bottom. I used very hot almost boiling water. Any ideas? I have a load of laundry in right now with this new soap. Hope it comes out ok. I just mixed everything like your recipe states and as soon as i added the castile soap everything clumped up. Any suggestions? Maybe I should take out the salt. I have just made the laundry detergent this morning and used it in our front load washing machine. It does not lather well but a huge difference in my clothes. It’s softer and I added Ylang Ylang to my mix. It smells divine. Borax.. a “chemical”? Borax occurs naturally, it is usually found in evaporated lakes. Our entire planet is made up of “chemicals”- you, me, soap is a mix of chemicals. Borax, it is impossible to be allergic to it, but some may not like the feel of it, if too much is used on a fabric. It could be self-induced psycho-somatic sensitivity. But please, borax is a completely natural thing. Works great in HE washer. I like the idea of this, but it leaves white residue on my clothing every single time, even when made with boiling water and shaking vigorously before using to mix again. Any ideas? I’ve never had any issues with this, but I wonder if it might have something to do with the temp of your wash water or the hardness of your water? It works! For all of you who want to save our planet from harsh chemicals this is part of the solution! Once the load is done, sometimes I add a few drops of lemon essential oil to the dryer to add a pleasant smell to the washed clothes. I just shared it on Facebook. It deserves to go viral! Thank you so much for making your recipe available to everyone! I have used it HE washers. I use about a cup for every 6 loads of laundry. It works great and it make my cloths feels like i washed them 100 times. It also feels like i used fabric softener in the laundry. ( I didn’t ) I will keep using this AWSOME recipe. Thank you. YOU HAVE AWSOME HOMEMADE DIY WORK!!!!! brb buying one of those glass jugs and some castille soap. Just curious, can I use scented Dr. Bronners? I know it says unscented but I wasn’t sure if that was for sensitivity purposes or because it actually compromises the recipe. Thanks for sharing with us! Yup, I just leave it out because a lot of people struggle with fragrance (even natural ones), but if you don’t, go for it! Awesome, thanks! We have well water.. Do you think that will be an issue? We have a softener.